Tucked into the foothills of the Appalachians, in Ashland, a town borne of the once-thriving Pennsylvania coal mines, sits a two story house. 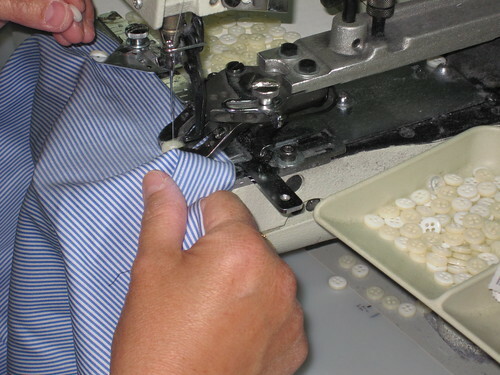 That house is home to one of the last great American shirt makers, Gitman Bros. The basement of Shelly Gitman’s former home. The factory is the size of four football fields. He’s not kidding. And neither am I. The state-of-the-art Gitman Bros. factory is built into the basement of Sheldon Gitman’s former home. The ladies who work in the first and second floor offices — really just converted bedrooms — use the pea green tiled bathroom as one of their break rooms. “How often do you find a microwave on the master bedroom sink?” One of the women quipped. They seem to love the quirky aspects of their surroundings. “See those file cabinets? They’re in an old walk-in cedar closet!” One exclaimed. 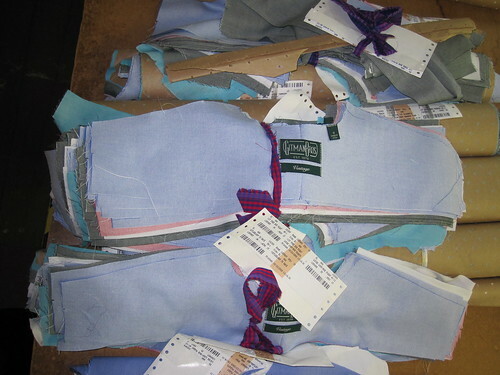 In the late 1930s, Max Gitman, a shirt contractor in Brooklyn, struggling to keep his factory going amidst pressures from rackets and unions, joined forces with other shirt makers — the predecessors of Eagle, Gant, Kenneth Gordon, and Sero, to name a few — and moved one-hundred-fifty miles away, to booming Pennsylvania where they’d ply their trade. 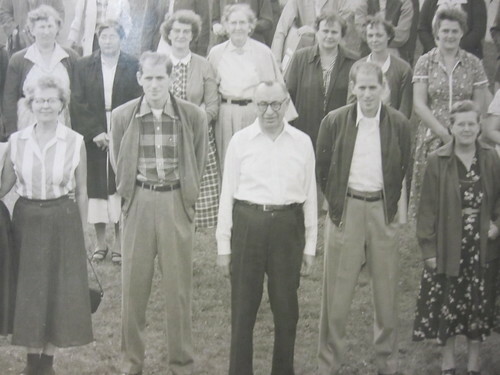 While the men worked the coal mines, Max and his cohorts would train the women to become skilled shirt makers. With the culture of shirt making fully ingrained, for many years, Ashland, this lump, this tiny chunk of the coal region became known as a hotbed of better shirt making. 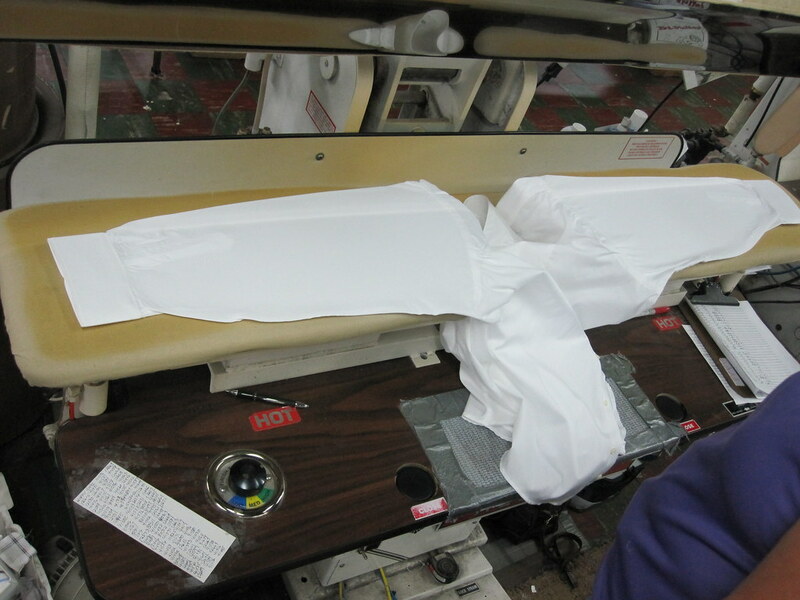 While in the last thirty years, most of the factories have closed shop and shipped their production overseas, Gitman stands tall. 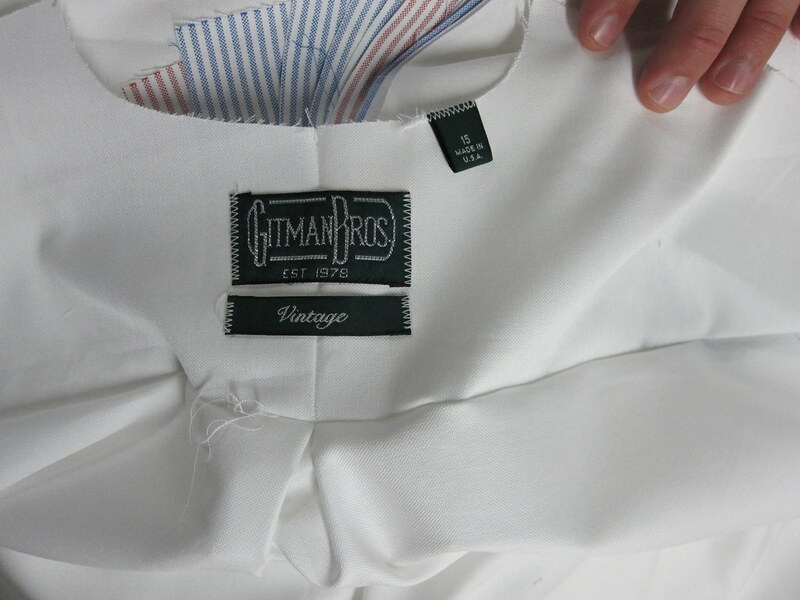 I was shocked to learn that many of the employees of Gitman are third and fourth generation shirt makers, and sometimes all three are still employed with mother handing off to daughter handing off to daughter. In this place, they talk of “good needles;” which is to say, a trained sewer is raised in the culture. Anyone can learn to sew, but, as I learned on my visit to the Quoddy Moccasin factory, where they struggle to find and train new handsewers, to have been born and raised into this has become a treasure in this country. In the morning meeting, I loved watching while three different solutions were offered for how to best turn a collar, hands flying this way and that over a pile of broadcloth. 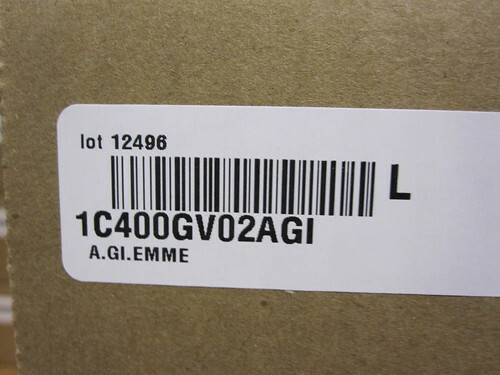 Gitman Vintage’s Chris Olberding discusses tag placement for the line’s latest innovation. For Spring 2011, they will offer a selection of Japanese organic fabrics. Fast-forward thirty years. One day while at the factory, Gitman’s youngest associate, Chris Olberding stumbled upon a dusty pile of old line books, and his mind started racing. “It was perfect. It was exactly what I saw happening in the marketplace,” he explained. 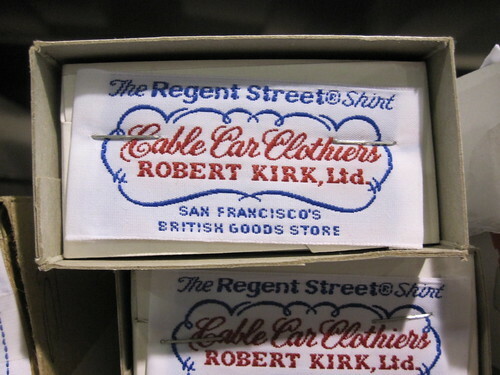 Starting with the vintage t-shirt hunters and sneaker freakers, the youth culture began turning its eyes to things of the past, quality products made with care in a manner considered old-fashioned, nearly dead. The same kid who’d spent $1000 on a pair of original Nike Waffles was investing in a pair of Danner Boots, also made in Oregon, and not far from where those Waffles originated. 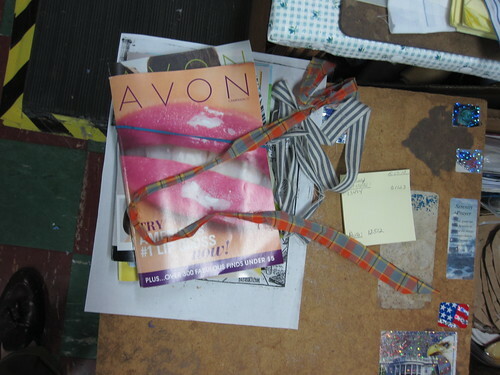 Selvage denim became coveted. The heavier, the better. 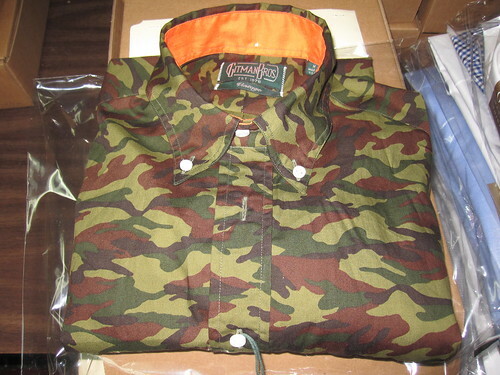 Work boots, canvas bags, and naturally, the progression lead to shirts. Where in other aspects of the culture — the food industry in particular — supporting small, local businesses began to take hold, folks wanted to buy things made closer to home, because it required less fossil fuels to ship that thing to its final destination. 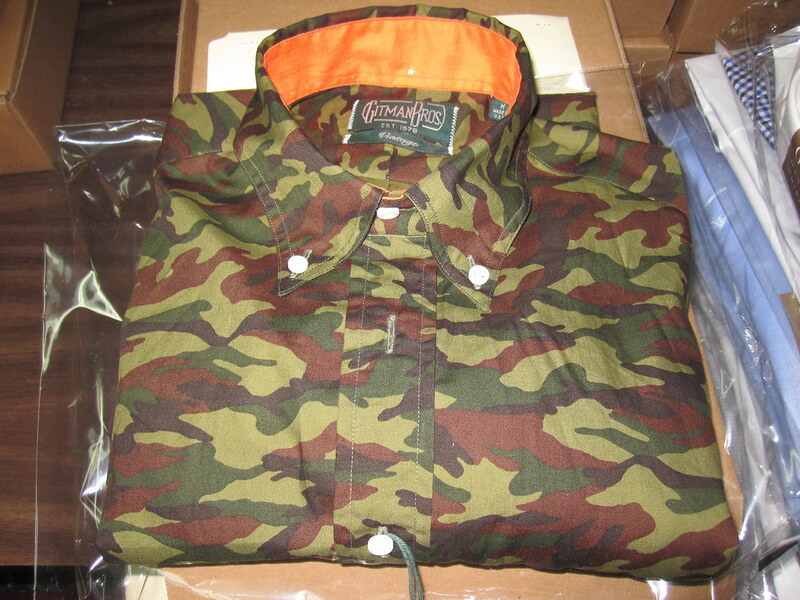 For Spring of 2011, part of what Mr. Olberding is calling his “Jungle Collection,” he’s offering a Camouflage and Blaze Orange shirt, a bolder choice along with several animal prints. 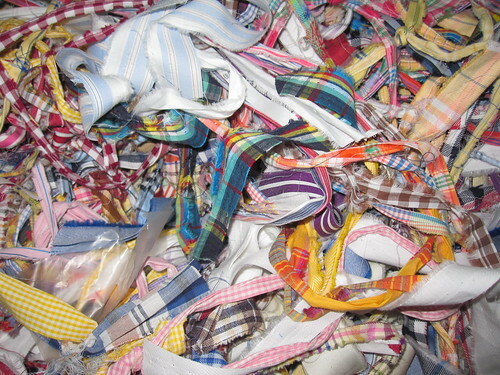 The yoke of a Vintage madras, cut and ready. 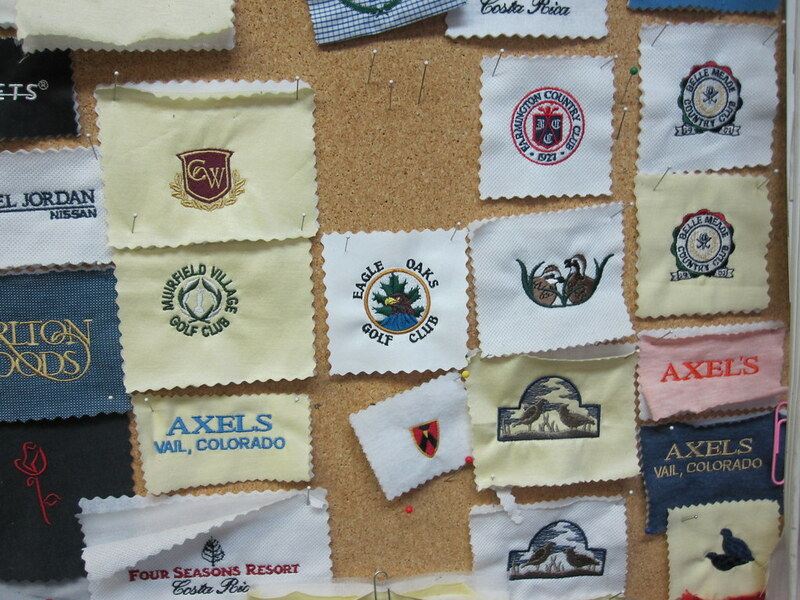 Plus, the fabrics are unlike anything out there. “There are patterns, stripes, plaids in these books that no one has seen in thirty years,” notes Mr. Olberding. But Gitman Bros. was unknown to the young customer (The only reason I knew Gitman was because a former employer assigned me to track down Thom Browne’s shirt maker). 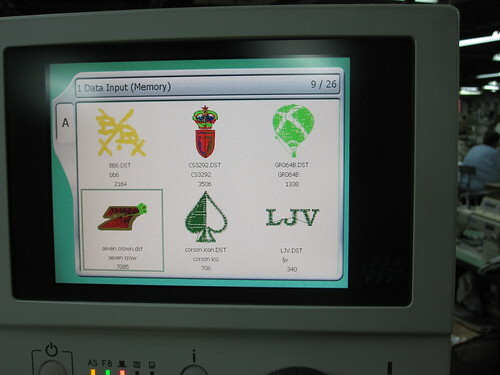 Over the course of the last thirty years, the brand grew old with its hip and happening customer of the 70s. It got fatter, too. Mr. Olberding trimmed the fat, four inches in total. 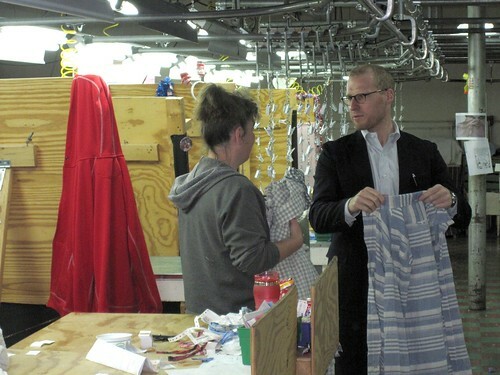 He worked with the factory’s artisans to perfect the fit, and then he went about reproducing some of his favorite fabrics from the archives. And like that, they took off. More athletic than a Band of Outsiders, less relaxed than a Steven Alan, in its fourth season, the Gitman Vintage shirt is now regarded as one of the best-fitting shirts around. 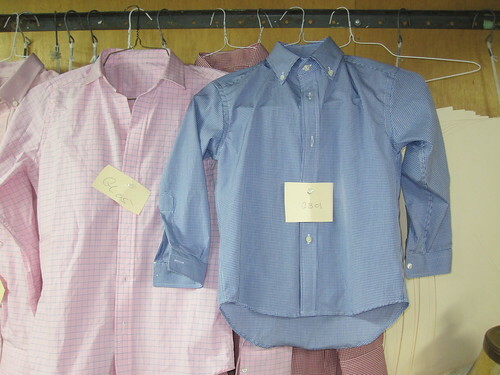 The basic button down oxford sells just as well as a stripe or a plaid from the 1980s. Warehouse Manager, Diane Moser removes the Gitman label and applies a heat-sealed private label to a wing collar tuxedo shirt. Shirts are packed two-to-a-box and labeled with a bar code and the store name. 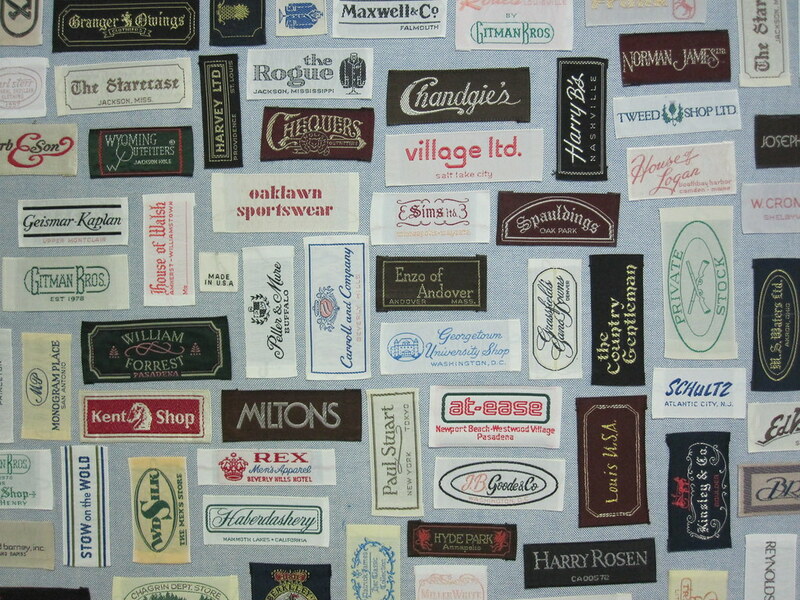 This box of Vintage shirts is going to A.GI.EMME, a store in Como, Italy. A co-labeled shirt, like the ones seen here were once the standard among finer men’s boutiques in the United States. Producing private label shirts, like this Regent Street Shirt for Cable Car Clothiers, was the majority of the business for Max Gitman. 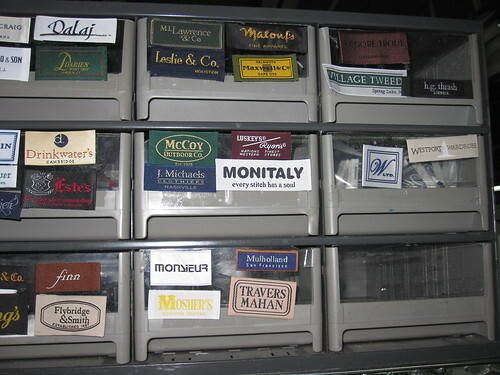 Hundreds of file cabinets line the walls of the warehouse, stuffed with tags from retailers new and old who have made shirts at the Gitman Bros. factory. 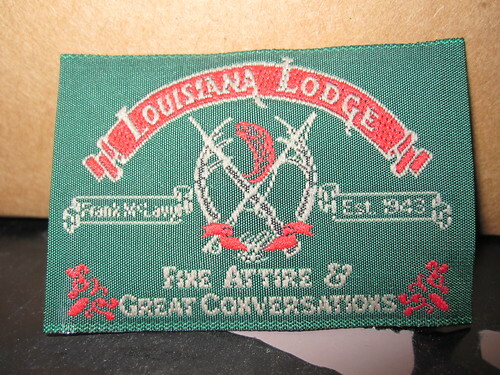 “Fine Attire & Great Conversations.” This tag for Baton Rouge store, Louisiana Lodge is a personal favorite. Note the shotgun, fishing pole, antlers motif. 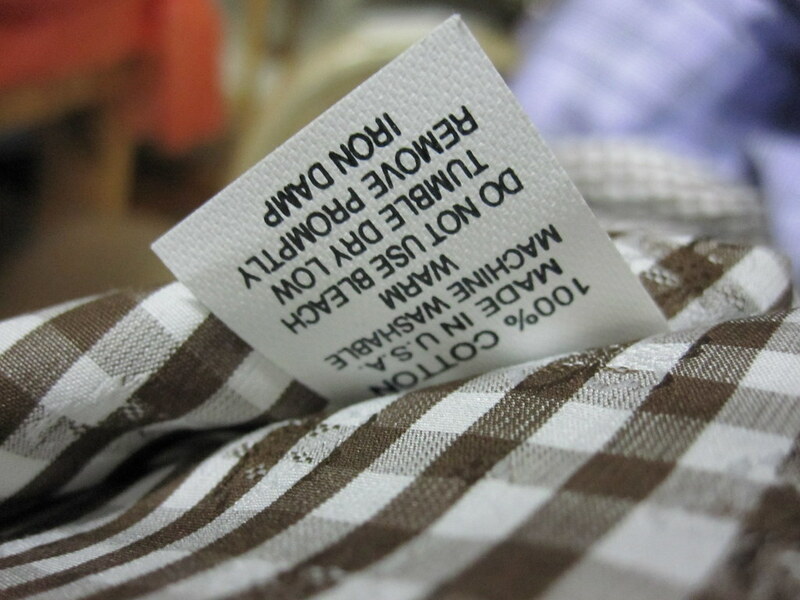 There are thousands of these tags on file. 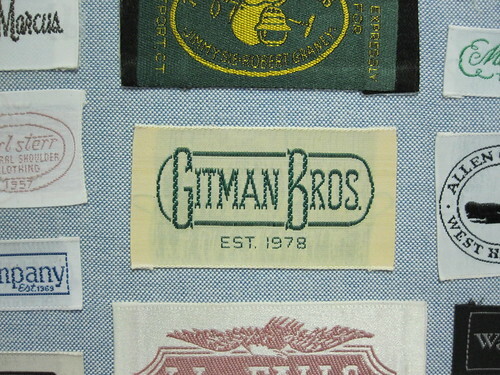 This was the original label for Gitman Bros.
Monogramming is also big business for the factory. They sell to golf pro shops all over the world. Gitman Vintage yoke bundles await their fate. 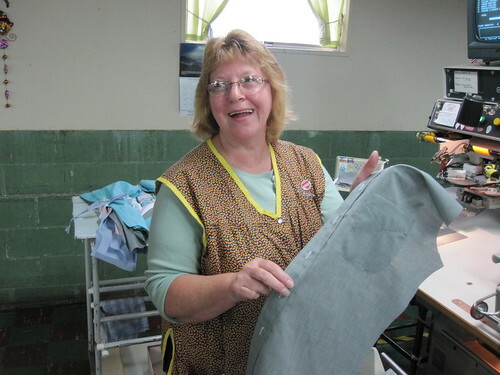 Patsy “Pockets” Schaeffer attaches chest pockets to the left front of shirts. Ms. Schaeffer shows off her handiwork. 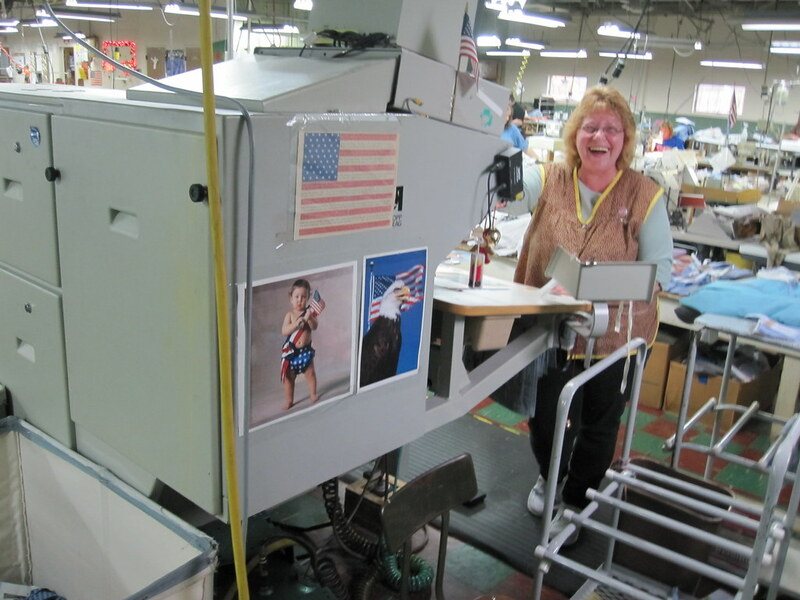 Of everyone I met, Patsy seemed to love her job the most. With a wide smile and a big laugh, she takes real pride in her work and has a great time in the process. 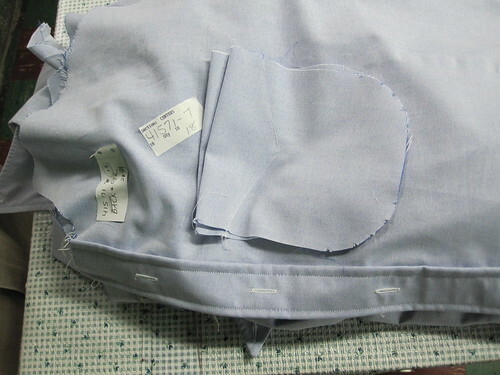 Where sleeve meets cuff, there is formed a small house-shaped opening, called the doghouse. 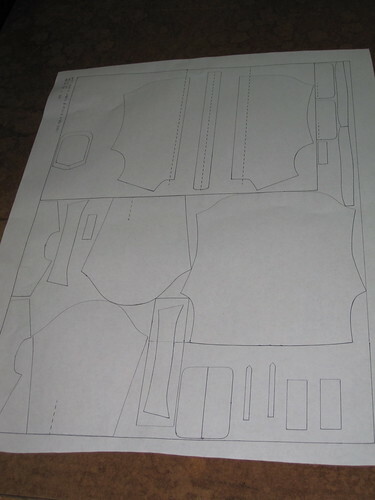 You can see that with a quick origami move, it’s formed entirely by hand. Once a shirt is finished, it goes here to Cathy Yagodzinskie. 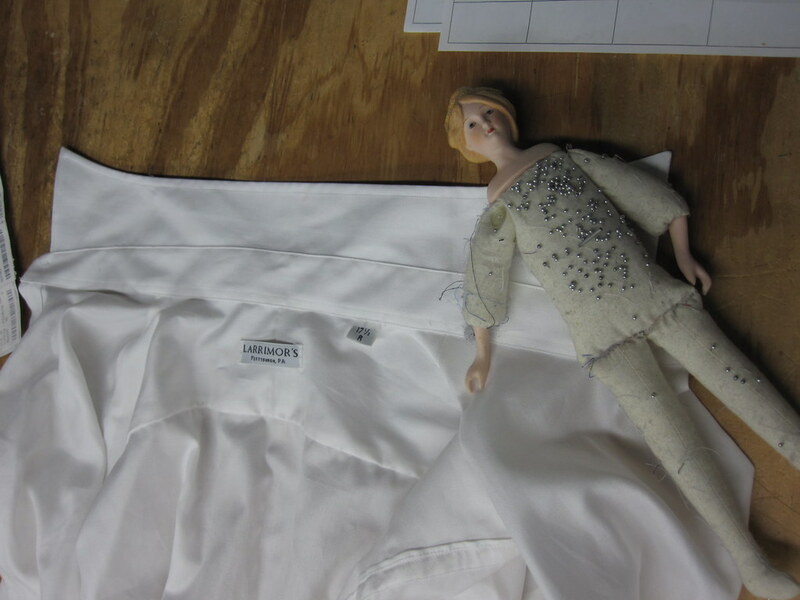 She examines each shirt for loose threads, any flaws, and makes sure they’re ready to ship. 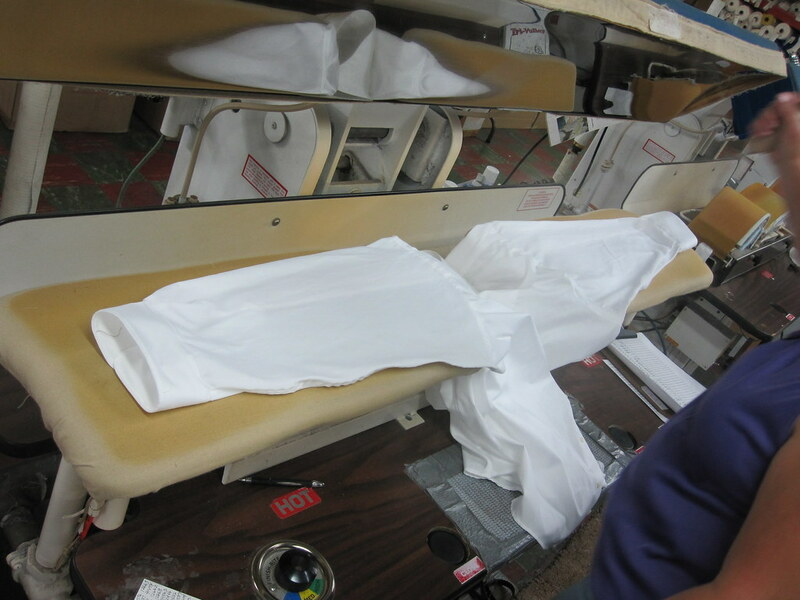 Before heading to packaging, the shirts are pressed and folded. 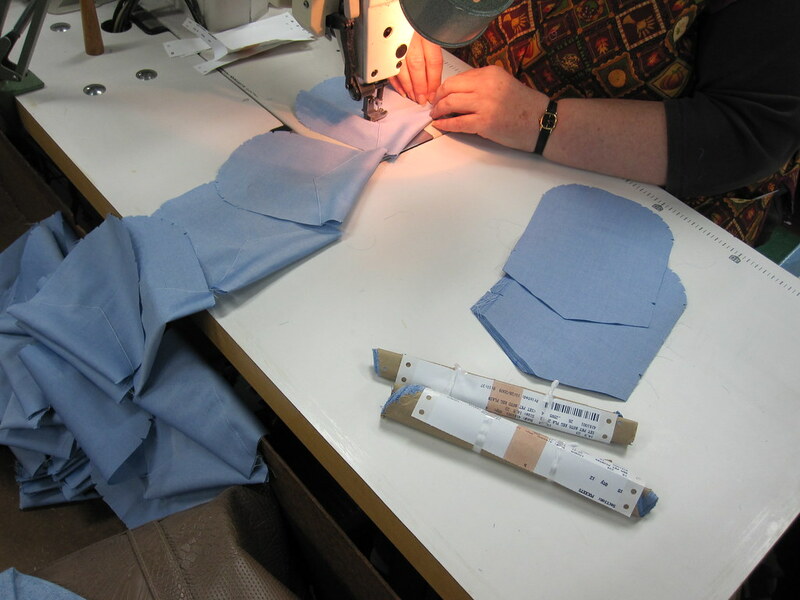 Of all the machine presses, the sleeve machine was my favorite. Before, they look tired and lumpy. After, stiff as a plane’s wing. For more of my visit to Gitman Bros. see Flickr. 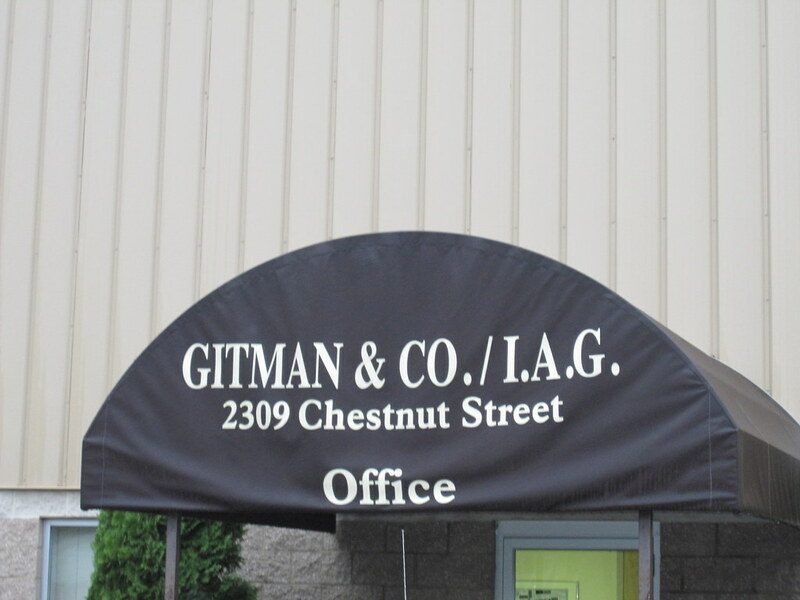 Special thanks to all the folks at Gitman for a terrific visit. 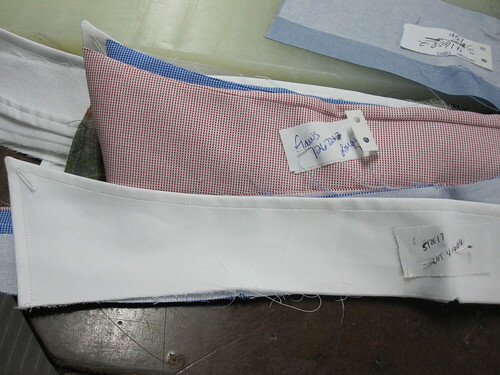 Possibly the best documented and most interesting post on a shirtmaker I have ever read. Wonderful post. 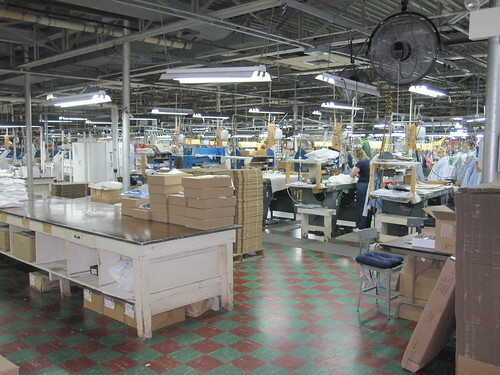 I’m wearing my G Bros chambray as I type this, and appreciating it all the more having had a glimpse into the factory from which it came. I can’t wait to see those Japanese organics. Damn, this was the king of factory tour posts. Well done. This was great. Thanks for posting and taking the time to document the tour. 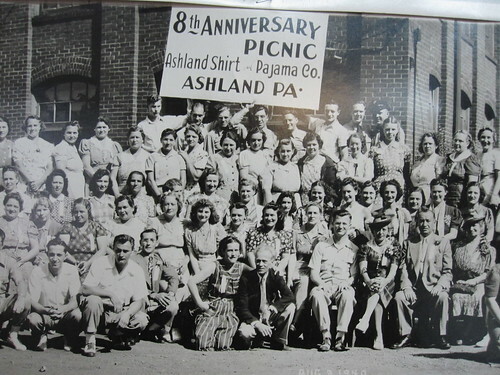 Three generations of skilled American factory craftspeople….proud and private….OUTED.Thanks, Max, this was a story that needed to be shown well and you did that.I never walk thru the finishing area without thinking how profoundly beautiful the shirts made by the Ashland workers are time by time.We are proud to be thriving,but too much of this irreplacible American beauty has already died. I hope someone somewhere pays the same mind to this extinction of a culture, as they do to that of a species.SAVE AMERICAN FACTORIES,THEY CANNOT BE REPLACED. Very well put together. My first visit here, more to come. A great story about an unusual place. 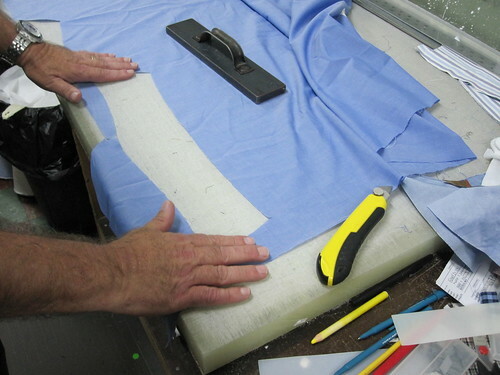 It’s amazing to see how much hand work goes into a Gitman shirt. 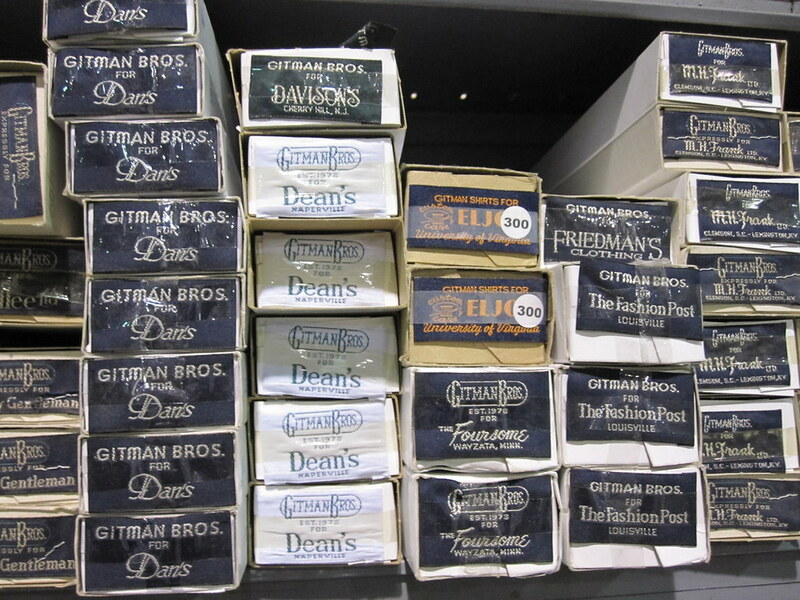 Thoroughly enjoyable tour behind Gitman Bros. Thanks for allowing us to tag along. Excellent and thorough post. 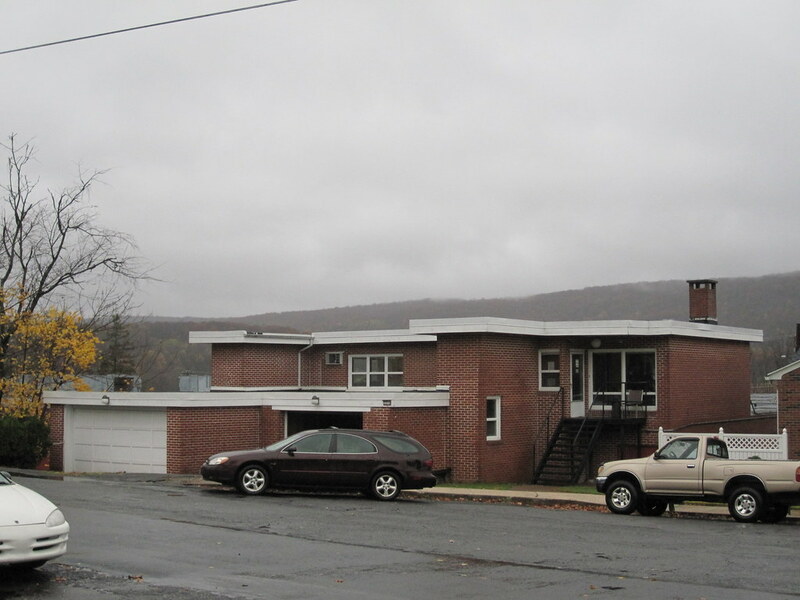 Our Company purchases another company a few year’s ago and that company’s corporate offices were out of a converted one story home. They kept the office supplies on shelves in the shower. It was awesome. Simply awesome. I like seeing people who take pride in their work. Always been a fan of Gitman, this only helps confirm. This is phenomenal. Great read & I just picked up two Gitman shirts. Planning on them lasting me a life time! Put me down for the camo shirt. Loved the post !!! I’m a fan of Gitman Shirts! This was a fascinating entry. Thanks so much! I bought some Gitman Bros. shirts at Alexander-Beegle in Virginia when I was in college; at the time I didn’t know anything about the shirtmaker other than the quality was outstanding. Still some of my favorite shirts. I also have great clothing from Mallards in Chicago from my grad school days. Mallards was founded by my old friend Joe Cecil, who eventually went to work for IAG/Gitman. It’s so neat how this all seems to come full-circle. Had the pleasure of meeting Shelly Gitman yesterday. A very interesting and gracious gentleman. 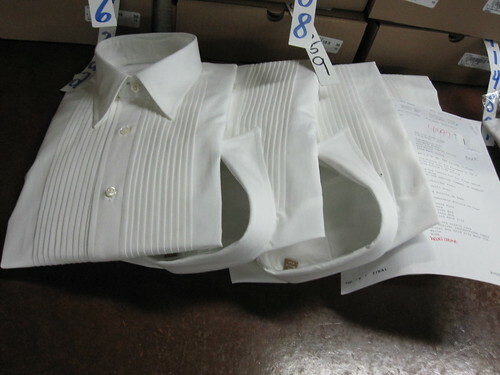 He was wearing one of his short sleeve sport shirts, and gave me quick tutorial about a quality shirt. 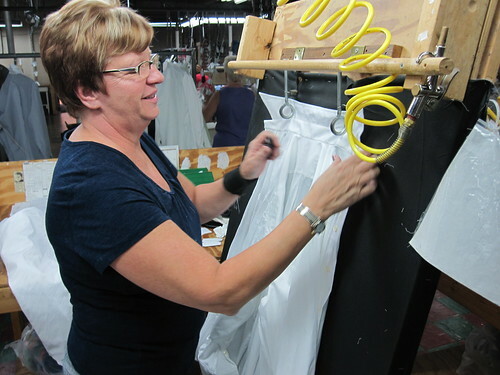 I have worked in economic development in PA for 15 years… and I have NEVER seen so inspiring a story about what can be done in clothing manufacturing right here in the USA. Wow, and kudos to the Gitman family and the dedicated workers! 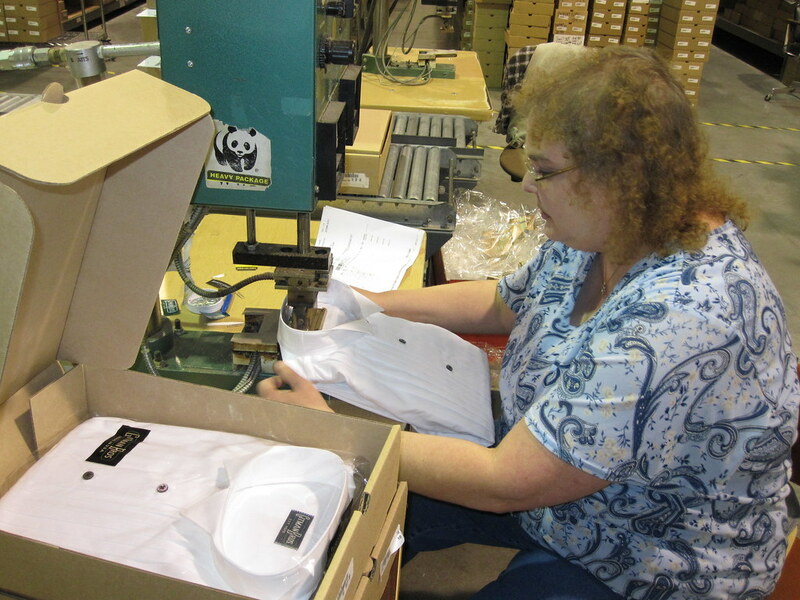 I’ve a few Gitman shirts, but I never realized they were totally made right here in PA.